Inter regional loco hauled services from Brighton 1994. 1994 saw the start of another major reroute for The Sussex Scot. The train along with others now ran via Manchester Piccadilly giving 2 trains a day Brighton to Manchester and a better service from Manchester to Scotland. The destination was again switched to Glasgow Central. The Summer Saturday services continued to run to and from Eastbourne, although to save an ECS move from Eastbourne the southbound 'Sussex Scot' still ran to Brighton. 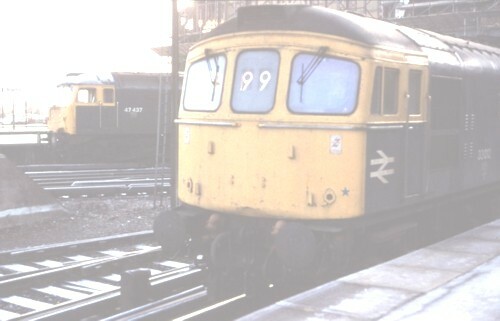 1994 also saw the introduction of a half-hourly Clapham Junction to Willesden Junction service on weekdays as a result the call at Clapham Junction on the Intercity trains was withdrawn. I think that the introduction of central door locking and the short platforms at Clapham Junction also played a part in this. The Dover service was restored again for a 4 week spell on Summer Saturdays, now cut back further to and from Wolverhampton in more or less the same pathway, it continued to be routed via the West Coast mainline. Once again the Sunday services ran via Redhill and Guildford. C = 5th June 1994 to 24th September 1994. Class 47/8 operation working was to and from Manchester / Preston with electric haulage north of Preston. I think the Saturdays train to Dover was Diesel hauled throughout, If you can confirm this please let me know. Standard 7 Mk2f car cross country set formed BSO TSO TSO TSO TSO TSO RLF. 47811 waits for the 'RA' at East Croydon with 1O66 the Saturdays only 0717 Manchester Piccadilly to Eastbourne. Photo taken June 11th 1994. Photo taken Tuesday June 14th 1994. 86216 'Meteor' arrives at Edinburgh with 1S76 the 0855 Eastbourne to Edinburgh. Photo taken Saturday 25th June 1994. 0717SO Manchester Piccadilly to Eastbourne service. Slide dated 2nd July 1994. Photographer unknown / Authors collection. 47827 approaches Wandsworth Road having weaved around the maze of lines south of Latchmere Jct. The service is 1O99 the 0830SO Wolverhampton to Dover Western Docks. Photo taken 30th July 1994. 47811 departs Oxford and passes Beckett Street with 1S76 the 0920 Brighton to Edinburgh, The Sussex Scot. 47839 approaches its destination, Dover Western Docks, with 1O99 the 0830SO from Wolverhampton. Photo taken 24th August 1994. 47806 scurries along near Wilmington, Polegate with 1M50 the Saturday only 1355 Eastbourne to Manchester Piccadilly. Photo taken 10th September 1994. 86227 'Sir Henry Johnson' waits at Carlisle with 1O90 the 1040 Glasgow Central to Brighton service, the 'Sussex Scot'. Photo taken 22nd September 1994 . Photographer Graeme Phillips / Authors collection. 47847 stands at Eastbourne with 1M50 the 1355 Saturdays only to Manchester Piccadilly. Photo taken 24th September 1994 . 1344 Dover Western Docks to Wolverhampton. Saturdays only 1/10/94 to 27/5/95. Authors collection. The Sussex Scot going to Bournemouth! Nice misprinted label, should be the Dorset Scot of course. 47851 climbs Acton Bank from the Great Western Mainline with 1O66 the 0717 Manchester Piccadilly to Brighton service. The train will then head north again to Willesden West London Junction before turning 180 degrees and heading south for Kensington Olympia it's next station stop. Photo taken 28th September 1994. Photographer S.Withers / Authors collection. 47828 is captured near Acton Wells during its slow trundle around west London with 1S76 the 0920 Brighton to Glasgow Central. The 'Sussex Scot'. Photo taken 10th November 1994. During 1994, Intercity Crosscountry issued several postcards, available from the Buffet Car, of their named trains. Here is the southbound 'Sussex Scot' in the Lune Gorge, Cumbria. 86260 is in charge. Here we see 86258 at Carlisle with 1O90 the southbound 'Sussex Scot'. A charter train of Mk1's is in the opposite platform. Photo taken 30th December 1994. 1S76 the 0920 Brighton to Glasgow Central. Image dated 3rd April 1985. 1O66 the 0717 Manchester Piccadilly to Brighton service.